Offering you a complete choice of products which include heat exchanger with expansion bellow. We are involved into making of Heat Exchangers With Expansion Bellow. Our ranges include heat exchanger shell bellows, expansion bellow heat exchanger and stainless steel heat exchanger. This exchanger is used to transfer heat. They cool down fluids in single phase. There usage can be find in chemical plants, refineries and re-boilers. 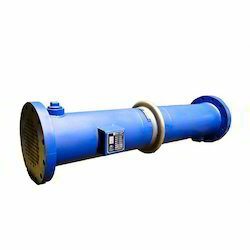 We are known heat exchangers manufacturers and these exchangers our available with us with best of prices. Looking for Heat Exchanger With Expansion Bellow ?